Ceramic glass is the ideal solution to high temperature applications. Ceramic Glass is sold under a number of brand names including Robax Glass®, PyroCeram Glass® and NeoCeram Glass®. Robax Glass® and NeoCeram Glass® are brand names of heat resistant ceramic glass that are suitable for use in woodstoves, wood pellet stoves and coal burning stoves. They are transparent ceramics that are extremely heat resistant. Tempered glass is not suitable for high temperature applications. Standard tempered glass expands when heated and shrinks when cooled. It is this expansion and contraction that makes standard glass susceptible to thermal shock and shattering when rapidly cooled such as plunging the glass into ice water. Ceramic glass such as Robax Glass®, PyroCeram Glass® and NeoCeram Glass ® have near zero thermal expansion which makes them very resistant to thermal shattering. OneDayGlass has chosen to provide PyroCeram Glass® and NeoCeram Glass® because of the superior heat resistance and performance in woodstove glass applications. OneDayGlass also provides 5/32” NeoCeram Glass ® in black for use in replacement ceramic glass cooktops. 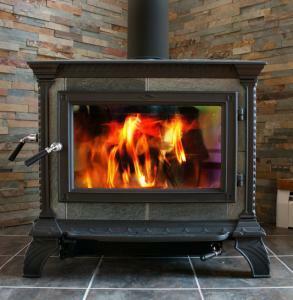 Click here to order custom cut ceramic glass for your woodstove.